1. High-crimp fine-ish wools are my favorite things to spin. CVM especially! Every spinning list in the world eventually has the Q & A what's your favorite fiber, and this is always my response. Sure, there's cashmere (oooh) and silk (aaah) but I just love the bounce of CVM and CVM-like wools for knitting. 2. I feel like I have more control over my spindle-spun yarn than over my wheel spun -- I can spin finer and spin more difficult fibers on my spindles. 3. I am STABLE -- and as much as I try to "spin from my stash", new bits and pieces keep sneaking in. 5 new fleeces a year from my flock, too -- what's a woman to do? 4. 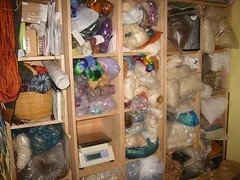 My stash has every type of fiber in it -- wools, silks, cottons, exotics -- except the poly-white-cut-up-soda-bottle stuff. It was still around when I started spinning, but has since disappeared from the marketplace. 5. My mother taught me to knit, crochet, sew, and make flowers from felt and pipe cleaners. We took a mother/daughter pottery class together too. But she's not a spinner. 6. I taught myself how to spin with a grommet-less CD spindle, coat hanger, and Lee Raven's Hands on Spinning. Quickly "graduated" to a Mongold spindle and a Louet S-10! My oldest unstarted project is a woven scarf with White Shetland neck wool from one of my (past) Shetlands, Pi and white Cashmere from one of my (past, too, sniffle) Cashmere goats, Winter. I'm thinking a nice arrowhead twill for that one ... the Shetland's washed, the Cashmere's dehaired, but I have not started the spinning yet ... hmmm maybe after the summer shows, it will be time! yeah! a new project! from my stash ;-) so I get points for that. 7.5 I bought a sock machine so I'd have more time to spin -- I felt I'd spin sock yarns and knit up a ton of socks. Ha ha ha -- now my commercial sock yarn collection rivals my sock fiber collection! I couldn't resist throwing in an extra one, consider it a bonus! By the way, you can find the plastic soda bottle stuff here. I've never tried it, but I'm curious.